The Ohio State student dental clinics are open to the public and offer dental services and specialty care for patients of all ages, including the medically, mentally or physically complex patient, as well as dental-phobic patients. Appointments may take longer than in a private office, however services often cost half of the Columbus average. 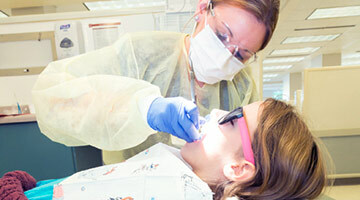 All care is performed by students under the supervision of our exceptionally skilled licensed faculty dentists. Advanced Clinics' hours vary. See a description, contact information and hours for each of our advanced clinics. Fees vary by procedure, but because care is administered by either student dentists or student dental hygienists, you can expect to save considerably when compared to fees charged in a private practice.